Maul Technology has skilled and experienced people utilizing state-of-the-art equipment and techniques to provide quality products and designs. We take pride in our customer service - from our first-hand knowledge of customer needs to the on-time delivery of high quality spare parts. We maintain extensive inventories of spare parts in our manufacturing locations for rapid response to customer needs. We set standards of customer service few can match. Our commitment to be customer responsive is combined with a working ability to be flexible in every element of the business, making customer service our key quality standard. Long experienced in the design and manufacture of IS machines and associated glass forming and control equipment, we cover the entire range of production needs for IS machine operation. 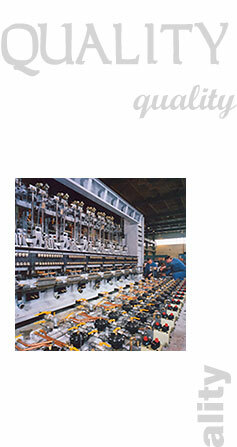 Our production facilities will manufacture and assemble any size of machine and number of sections. From a strong base of experience and technical ability, we have developed levels of working cooperation to ensure every contract is approached with the aim of designing and engineering, the best possible solution dedicated to the specific customer application. We have well equipped production facilities based on a constant emphasis on quality at every stage and a concentration on product finish, for which we are widely acknowledged throughout the industry. All modern techniques of test and inspection are employed. Spacious assembly facilities, designed efficiently to accommodate any size of IS installation, are manned by highly skilled and experienced engineers strongly motivated in the need for constant reliability in preparation for dispatch. The investment in production plant and facilities is matched by the skills and experience of a work force who have spent a lifetime at their trade. The importance of retaining all skills and experience is well recognized within the business and it reflected in appropriate training and updating programs, planned as an essential contribution to the successful future of the company. We have set our own standards in the world leading development of electronic innovation and the application of each new electronic advance to the specific use of the glass forming industry. The new generations of electronic equipment reflect the continuing investment in electronic engineering and in overall new product development, extending the existing wide range of our glass forming equipment and the efficiency and control in glass forming production. The new M-2000 electronic control system is in commercial use in glass forming plants in the USA, Belgium, Canada, Columbia, France, Germany, Korea, Mexico, the Philippines and the United Kingdom. As a complete touch screen, highly sophisticated control, coordinating all the complexities of advanced, continuous production systems, it ensures complete and detailed observation and monitoring and continuous remote surveillance and accessing. Our investment is focused on keeping ahead in electronic application awareness and in continuous new product development. The same well qualified skills and ease of flexibility are applied to ensuring customer satisfaction in repair, refurbishing and service. The first class repair and servicing facilities are strong in both electronic and mechanical resources. Worldwide, our service engineers have established a close working rapport with client production staff, and service support is increasingly maintained on the strength of a well informed detailed understanding of an individual client plant and the specific production system needs. Quick response is combined with flexibility in the options available to best meet the customer needs. We can provide a complete refurbishing service, an equipment exchange service supplying a refurbished machine with full guarantees, an on site labor service and the design facilities to carry out a part or complete operating redesign. Continuous customer service is well supported by the investment in spare parts production and stockholdings. Fast, efficient response is maintained by computer controlled administration and stock handling, operated by people who recognize the need to minimize customer down-time. Our spare parts are produced to stringent quality standards and are universal in their suitability for use on all major IS machines.